Floor truck locks - prevent rolling. Our truck locks are available in two types. The TLCM truck lock series is designed to be bolted to the side or end of the truck. The customer can drill the holes on the side or end, depending on where they think they will fit best. Four 10 mm clearance holes are suggested, the top pair being up to 353 mm and the lower pair not less than 226 mm above the ground. The TLCM truck lock series is equipped with side plate fitting, made of sheet steel and available with the plate fitting on the right or on the left side. The TLCH truck lock series is made from cast iron and has a top plate fitting. The lock provides a means of instantly securing a truck or other mobile equipment in a fixed position without raising it. The floor lock bolts to the underside of a truck with its top face exactly 200 mm above the ground to ensure optimum performance. 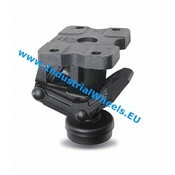 At IndustrialWheels.com you will find truck locks to suit every cart, truck, mobile platform and/or machine. Truck locks are an easy, effective and low cost method for preventing castored equipment from accidentally rolling away.